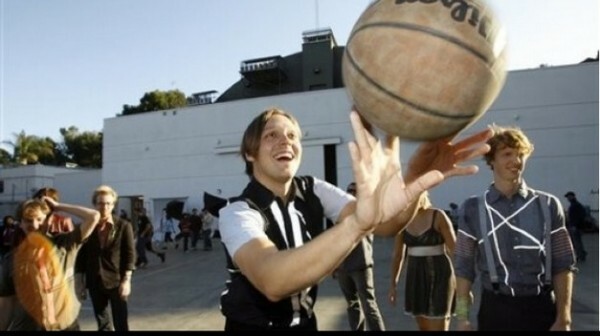 Just as Win Butler did last year, the Arcade Fire frontman will return to Pop Montreal for the second annual POP vs Jock: Charity Basketball Game. Rounding out Team Pop this year is Nikolai Fraiture of The Strokes, actor/comedian Martin Starr (Freaks and Geeks, Party Down), and pro-basketball player Luke Bonner (ringer!). The game will sport music by Kid Koala, Régine Chassagne, and a halftime show featuring David Byrne & Moment Factory. Earlier this summer, the festival announced an exclusive conversation between Byrne and Butler, set to take place September 22nd at The Ukrainian Federation in Montreal. The two will discuss Byrnes new book, How Music Works, in the context of their own personal and professional experiences as musicians and music lovers, according to a press release. On the music front, this years lineup offers Grizzly Bear, Gotye, Hot Snakes, Gang Gang Dance, Dirty Three, Lil B, Mr. Muthafuckin eXquire, and Tim Hecker. Plus, former American Idol contestant Jacob Lusk will perform a set entirely of R. Kelly covers, because he can. For tickets and more information visit the festival’s official site or contact McGill Sports Centre’s Red Bird Sports Shop at 514-398-1539.